Now, how do we decorate the tree again? Tell me ‘coz I forgot. 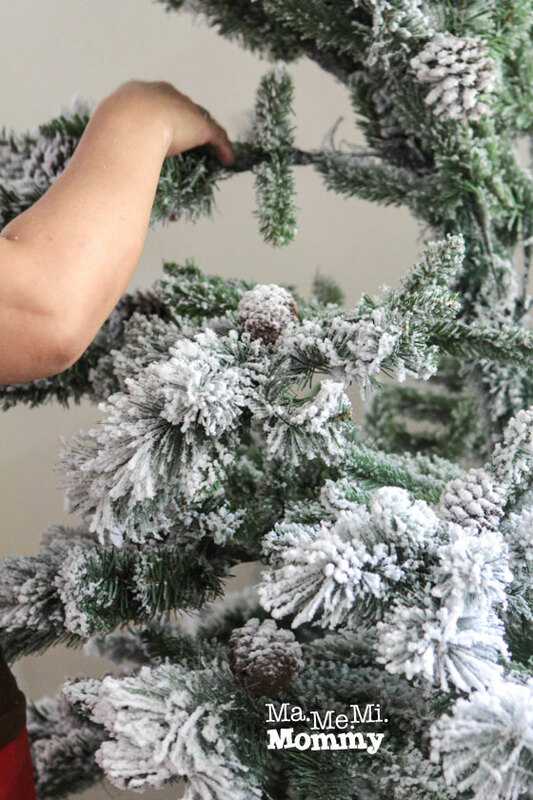 Unless you’ll be using a real tree, you would normally have to assemble the tree first. You’d start with the base and then insert the trunks by parts. You’d then open up the branches and the leaves. Christmas trees nowadays come in all sorts of colours and styles. 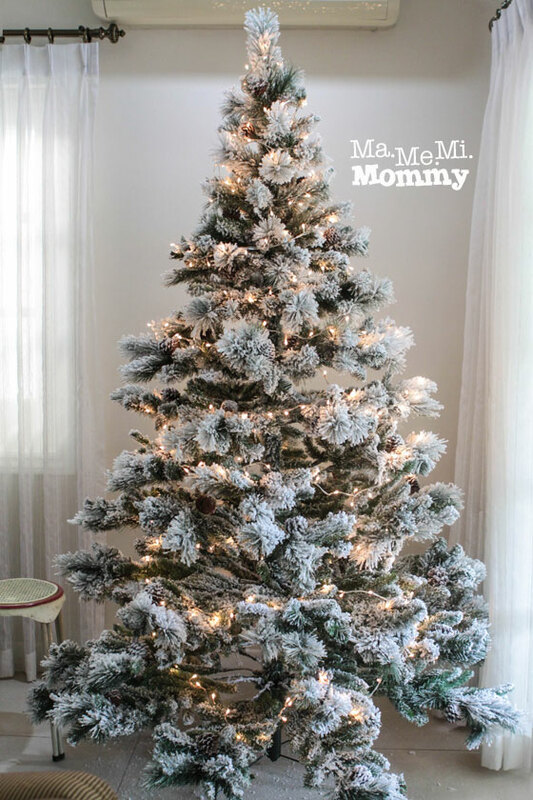 This one is a frosted style, with patches of snow covering the entire tree. There are also snow covered pinecones on the leaves. Whoo! I think I need to get my parka already! Gone are the old style Christmas lights where the bulbs are inserted into a socket and pushed into yet another socket connected to the wire. (I should know, I used to be that girl selling Christmas light bulbs at a peso apiece). In its place are these rice LED lights that are more durable (and I think disposable once broken). You can connect sets of these together to form the length you need. I started at the bottom, which is where the wall socket is. I wrapped it around the tree, laying the wires on the branches. I worked my way up to the top, connecting more sets as I went. I started with these bunches of red flowers. I scattered them all around the tree, making sure not to overdo it. 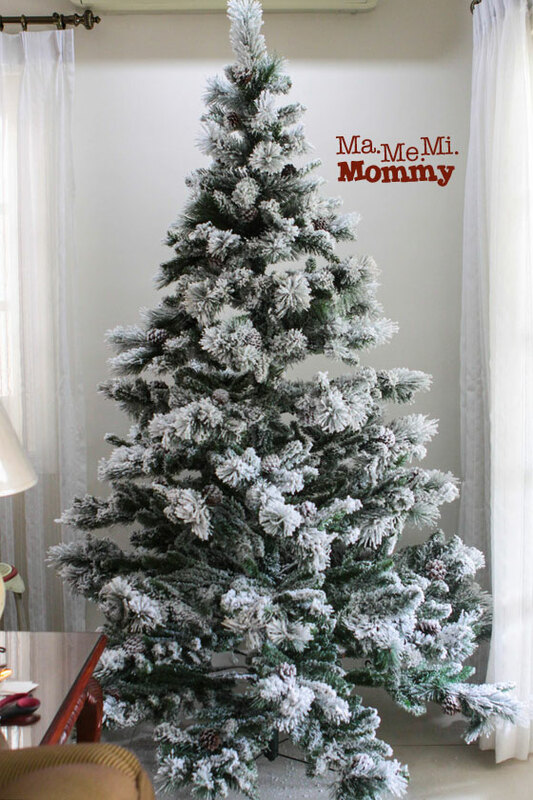 I wouldn’t want the frosted tree to lose its identity. I then added the stems to add some dimension to the tree’s basic triangular shape. 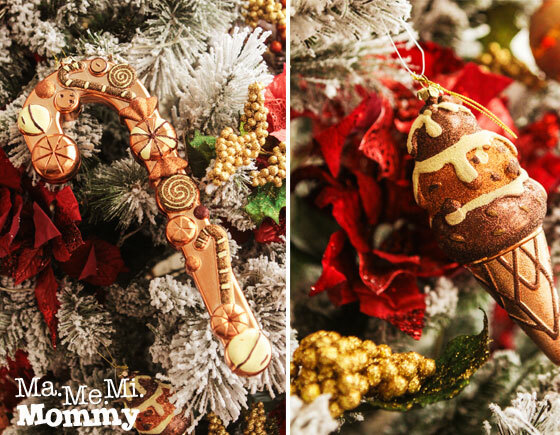 A closer look at these yummy ornaments! Can you tell that I have a sweet tooth? 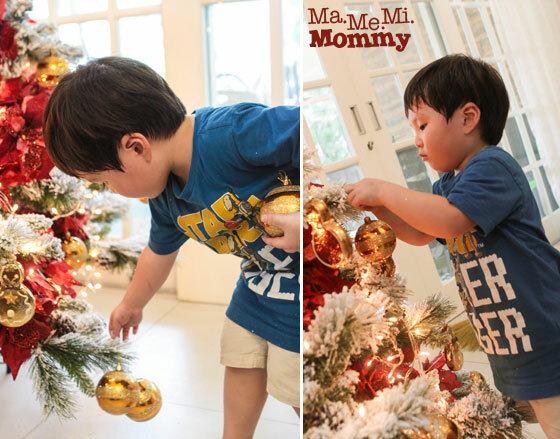 Finally, this boy added in the Christmas Balls. Ta-da! How does it look? Come up with a theme (Santa Claus, kiddie, floral, animals, instruments, etc.) or a color motif (single color or 2-tone) to build your design on. This will narrow down your search when you’re out shopping. 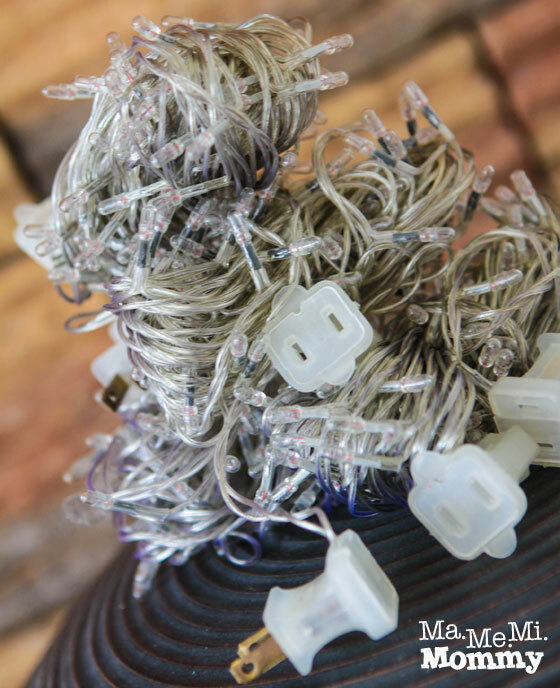 Choose Christmas lights with wire colors that matches your tree. It’s awfully hard to camouflage those unsightly wires otherwise. While decorating, constantly take a step back (so you can see the whole thing) and survey your work. If something seems wrong, correct it immediately. Don’t just focus on the front part. 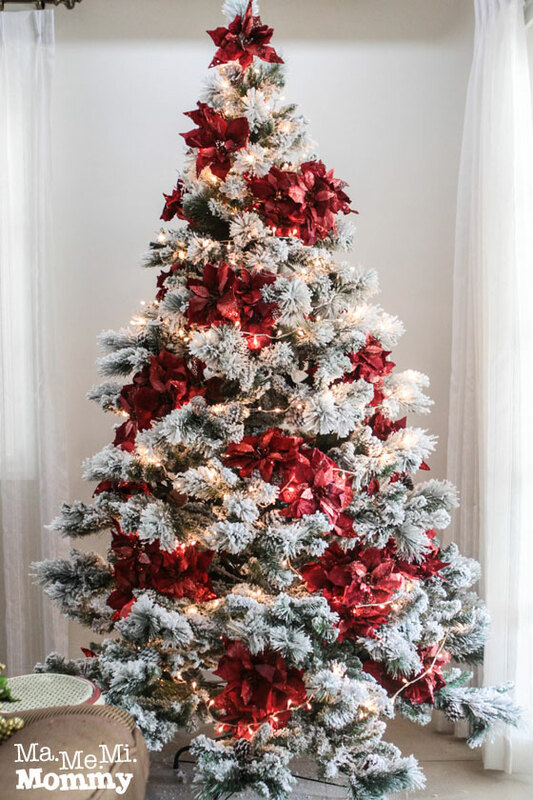 I was so intent on making the front part of the tree look nice that when I stepped to the sides, I saw that those were so bare. Yikes! Get ideas from mall/establishment displays. It never hurts to incorporate some of those inspirations into your own masterpiece. 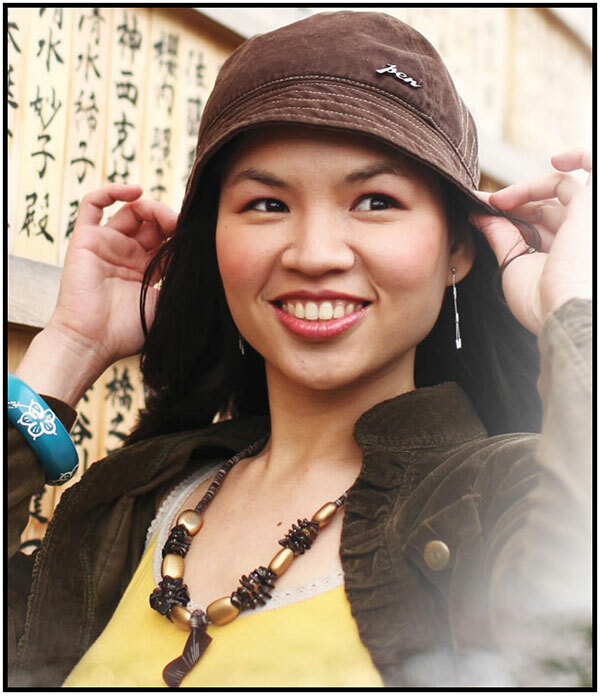 Celerhina Aubrey recently posted…Feeling Korean! Wow! 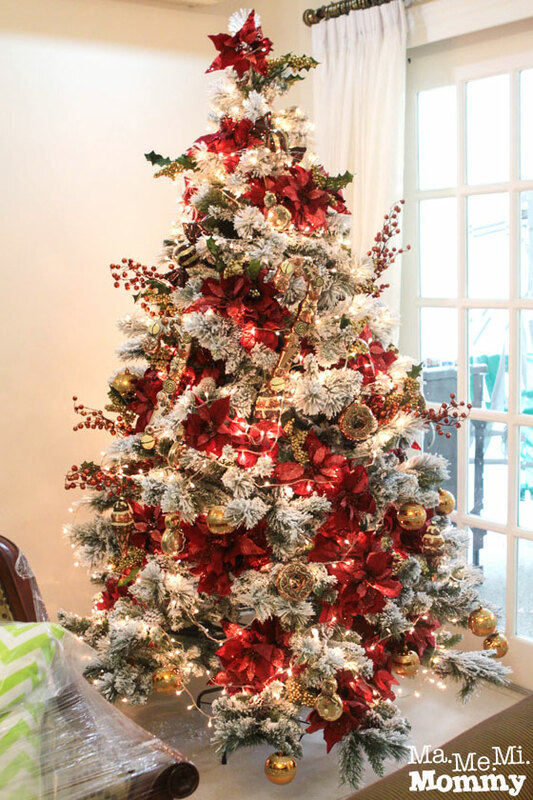 Ang ganda ng Christmas Tree nyo.. #Inggitmuch.. Hindi pa kami nakakapag set-up ng Christmas Tree, maybe on Saturday. I’m so excited kasi 1st Christmas ni Rhian to so I want to make it more memorable. Thanks Rackell! 🙂 Last year, I decorated with stuffed toys, para kiddie look hehehe. Nice tree! 🙂 where do you buy your ornaments? What a beautiful tree! I love the frosted look. I am actually thinking of a white Christmas theme this year and the colors in my mind are white and gold mostly. Hope will be able to pull it off. Wow! What a beautiful Christmas tree! I admire your talent of designing a tree. 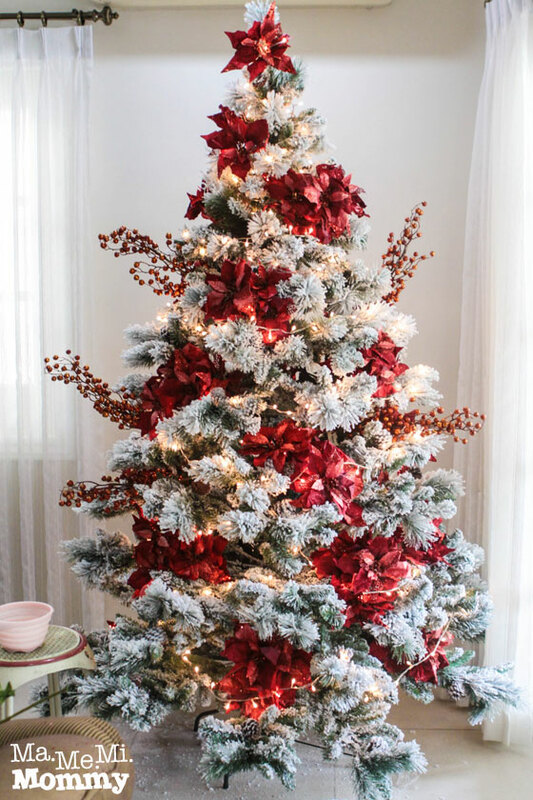 I love putiting up our Christmas tree too but I’m not creative enough to come up with a tree as beautiful as yours. Also, nakakahiya man aminin, this was actually the first time I learned that you should put the lights first before the ornaments. I always used to do it the other way around. Kaya pala hirap ako. Thanks for sharing! Ahh, oo nga. It’s actually tiresome to put up a tree, most especially when it’s time to put it down again hehe. I love the way you design your christmas.tree. Thanks for the tips. it really gives mean idea. We also choose a theme every year. Last year, we had gold and silver. 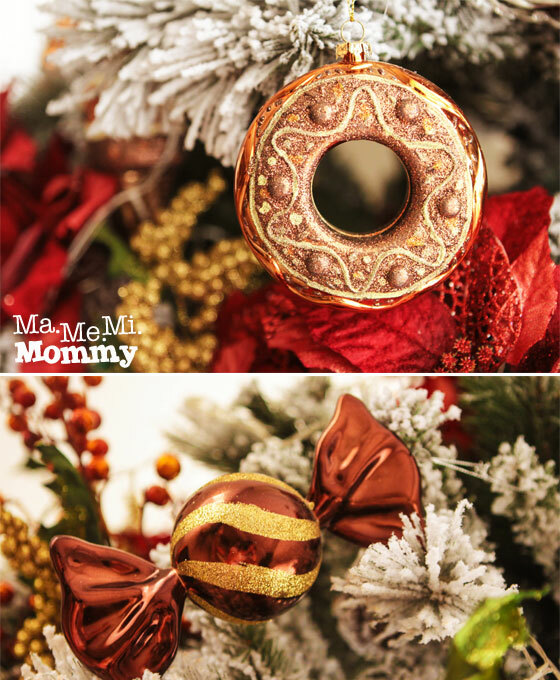 I want that red and gold, too, but I want your Christmas tree more! Haha! Mayu recently posted…Don’t Forget The Lifestyle Bazaar This Weekend! So beautifully red! We have ours blue naman! sooo0o0 lovely 🙂 Iba na talaga pag may art skills, wala ako kasi niyan 🙁 ang ganda ng creativity mo mommy. 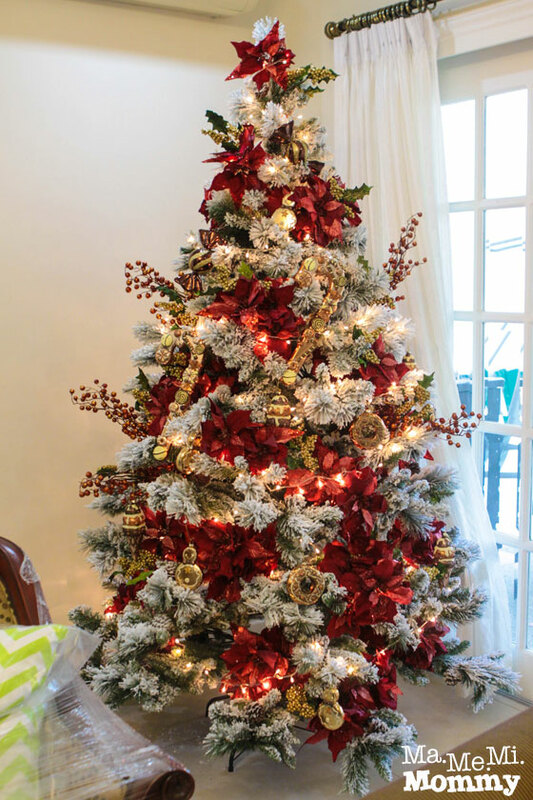 What more sa house decorations, merry looking ang Christmas diyan sa inyo mommy. Heart Calimlim recently posted…Glad Kitchen: Design your kids baon promo!